THE LUTHER VANDROSS EXPERIENCE available for Corporate Events, clubs, fundraisers and parties. The Luther Vandross Experience featuring Darron Moore travels worldwide and is a two hour stage production with a live band, costumes, and video production. Celebrate the remarkable legacy of Luther Vandross during this performance of The Luther Vandross Experience featuring Darron Moore. This show brings to life the soul-stirring sounds of Luther Vandross's legendary performances and honors the brilliance and music of one of R&B's most beloved singers. You’ll relive the unforgettable music and extraordinary dance moves of the legendary Luther Vandross, recreated through a mesmerizing fusion of dancing, eye-catching costumes, and song. The Luther Vandross Experience encapsulates the multi-faceted artistic output and creative soul of this incredible R&B Artist, a man whose legacy continues to inspire millions to this day. Enjoy an amazing performance of Luther Vandross’s most beloved hits such as, Never Too Much, Here And Now, Superstar, Stop To Love, Wait For Love, So Amazing, Glow Of Love and many more! By the end of your voyage, you will know it’s the perfect way to honor the musical and cultural legacy of this iconic R&B star, Luther Vandross. Luther Vandross was an eight time Grammy Award winner and is still an inspiration to countless performers. Darron Moore gives a dynamic and inspiring performance to honor Luther Vandross. As The Premier Luther Vandross Tribute Band in the nation, The Luther Vandross Experience featuring Darron Moore is a great fit for all Casino, Corporate, Festival, Nightclub, Birthday, Retirement, and Private events. Be it the full 12 piece orchestra or smaller instrument choice, or tracks, The Luther Vandross Experience has the right formula to fit your entertainment budget. Bring Class and Elegance to your event. 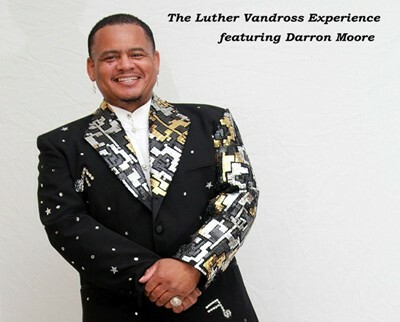 Book The Luther Vandross Experience featuring Darron Moore. Darron is supported by his stage team Tykielah Davis, Unique Cooper, and Dennis McDonald. In addition to the stage performers, Darron's Band members are Music Director and on Drums David Brandon, Percussions Marlone Bee Bop Crawford, Guitar Clarence Williams, Keyboards Antwon Green, and second Keyboards Craig Erqhuart Sr.
Darron Moore and The 14th Floor is a band that offers you a choice of packages based on your budget needs. Below is a sample of what is available. This Band Also Performs Motown, Classic Soul, R&B, and cover Various other artists such as Bruno Mars, Beyonce, Sade, and an array of others. Option 1 Full Band (Recommended) 4 Vocalists 12 Piece Band (2 Keyboards,Drummer,Bass,Guitar,Vibes,Percussions, 4 Piece Horn section,& Harp).